Heavy equipment prepares a pad Thursday along Kickaboo Road northwest of Madison where tons of materials are to be staged during construction of six wind turbines, Dane County's first commercial wind generation project. Epic Systems of Verona is building the 9.9 megawatt array to help offset its utility costs. Several energy companies have tried and failed to build on the spot since 2007, but Epic's effort works because the company isn't trying to make a profit and doesn't need investors, Richards said Thursday. "It's the amount of capital we have to get this off the ground," Richards said. "It's substantial." Richards wouldn't discuss the cost of the project, but said the company expected electrical savings to pay for construction within seven years. 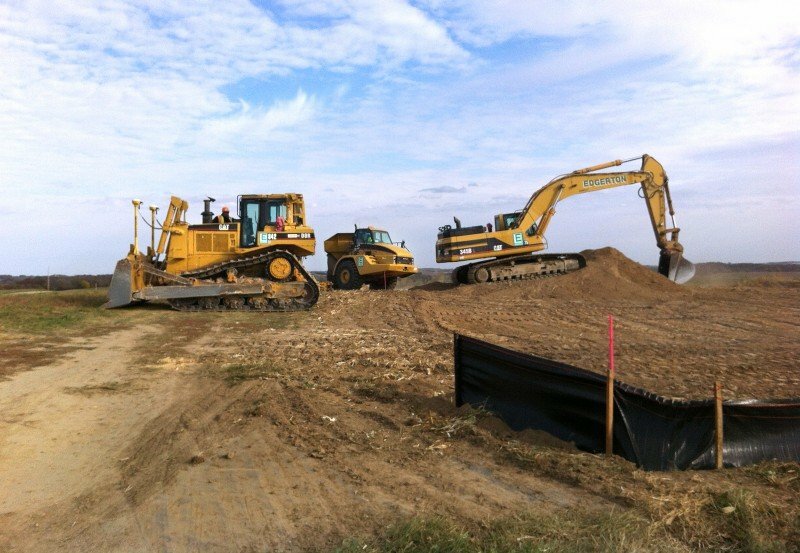 In 2007, the cost of a similar project was estimated at about $20 million by Freeport, Ill.-based Morse Group, which did initial feasibility studies, negotiated lease agreements with landowners and obtained several needed permits. Morse sold the project to an investor, and it passed through the hands of at least two other companies before Epic purchased it a few weeks ago after concluding that it couldn't build more than three turbines on its land in Verona without risking interference with future construction buildings, Richards said. Epic claimed about $1.2 billion in revenues in 2011 and expects to employ more than 6,000 by the end of this year. The largest is the 162-megawatt Glacier Hills Wind Park operated by We Energies in Columbia County. The smallest is the Lincoln Wind Energy Facility run by Wisconsin Public Service in Kewaunee County with 9 megawatts. Epic plans to sell its wind-generated electricity to Madison Gas and Electric Co. to offset its utility costs. MGE spokesman Steve Kraus said the two companies haven't negotiated a contract. At least one previous effort to build turbines on the site failed because the developer wanted a higher rate than MGE would pay. Richards said Epic has an alternative plan to send the electricity over existing transmission lines to its complex in Verona, although that would involve building an electrical substation and paying to use the lines. State law leaves permitting of wind power facilities under 100 megawatts to local governments. Dane County approved a land use permit for the original project in 2008. Some residents worry that the towers will lower property values, but studies haven't proved that will happen, said town of Springfield chairman Don Hoffman. "Some people think it's great, some people don't want to look at them," Hoffman said. "To me it's a good reminder to people that we use a lot of power and it's got to come from somewhere." 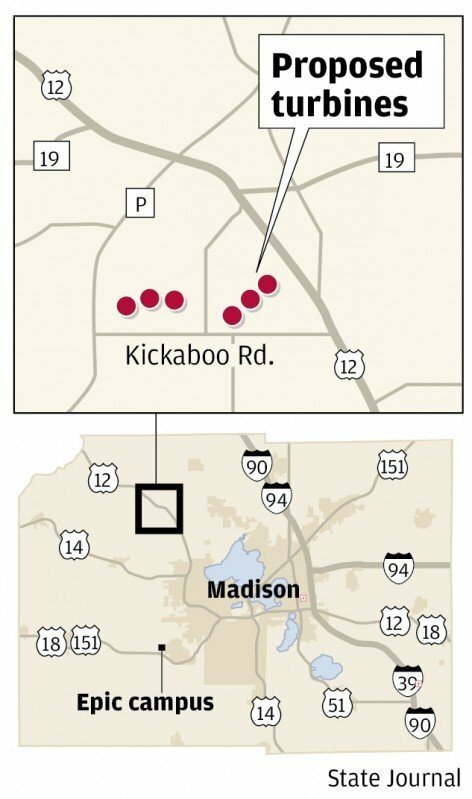 When the wind blows, at least some of the six towering new turbines northwest of Madison spin and generate power — but not much.